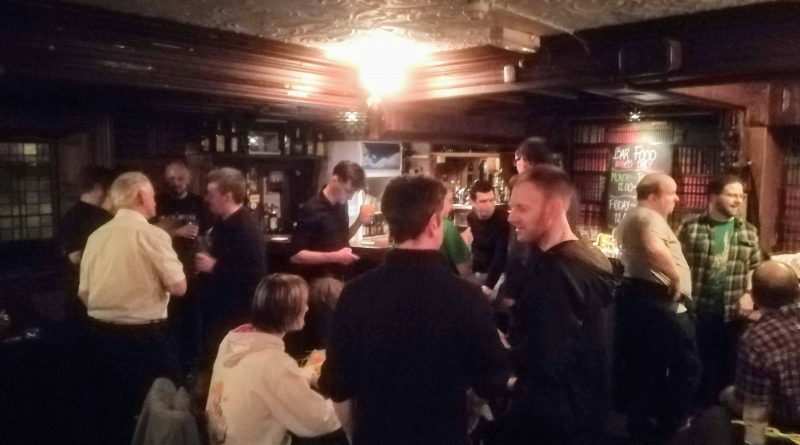 A small delegation of amigans decided to make the trip from Norway to Ireland for the first time this year, to attend the annual get-together hosted by Amiga Ireland on the third weekend of january. Compos, chit-chat, conviviality and carousing ensued. 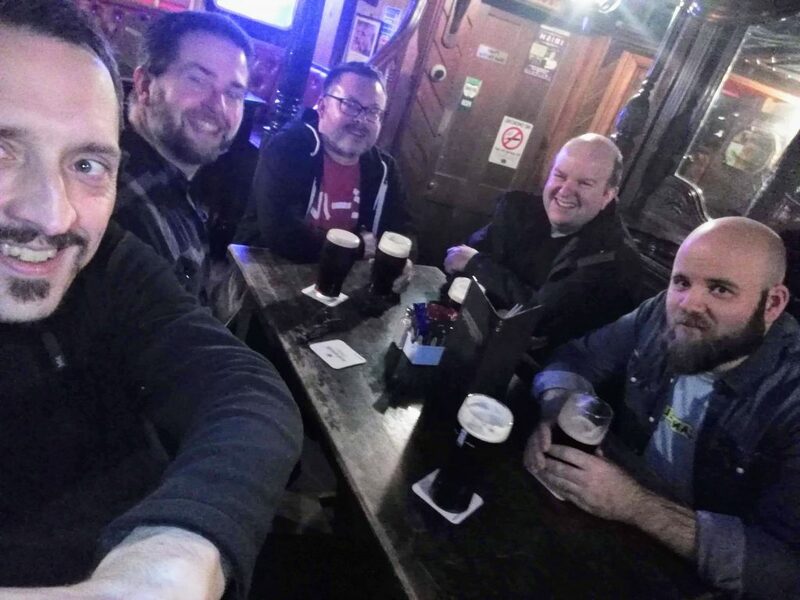 After missing out on last year’s event, a few representatives of the Nesodden Amiga Users Group teamed up with some of the norwegian residents from the Amigos podcast community to make the trip. 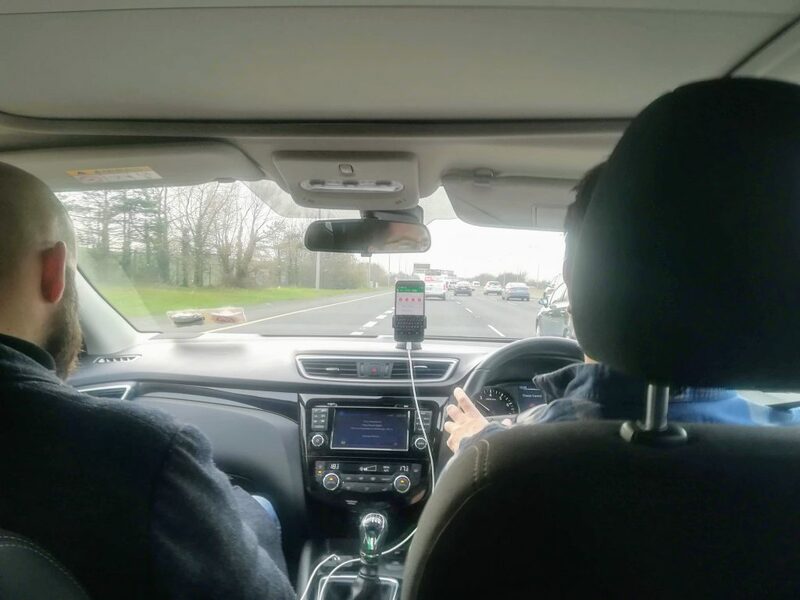 We arrived in the historic Irish town of Athlone on thursday the 17th. During the evening and the next morning several more attendees arrived, and it was immediately apparent that this was to be a very cosmopolitan event. I certainly remember meeting people from England, Scotland Poland, The Netherlands, Greece and Sweden. Amigos podcast co-host John «Boat» Shawler even made the trip all the way from the USA. 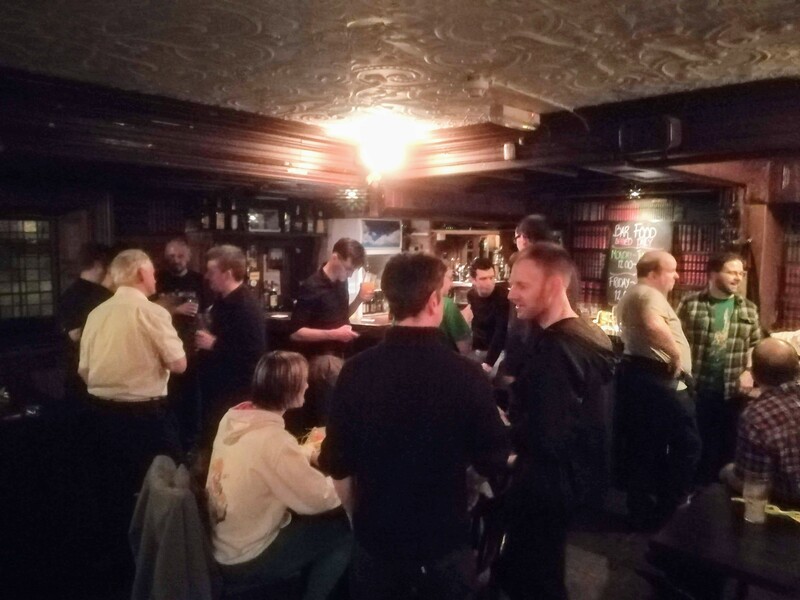 The event kicked off at 1 pm on the friday, with people gradually arriving, greeting each other (apparently most of the crowd already were acquainted from attending Amiga Ireland or other Amiga events previously), and setting up their equipment. 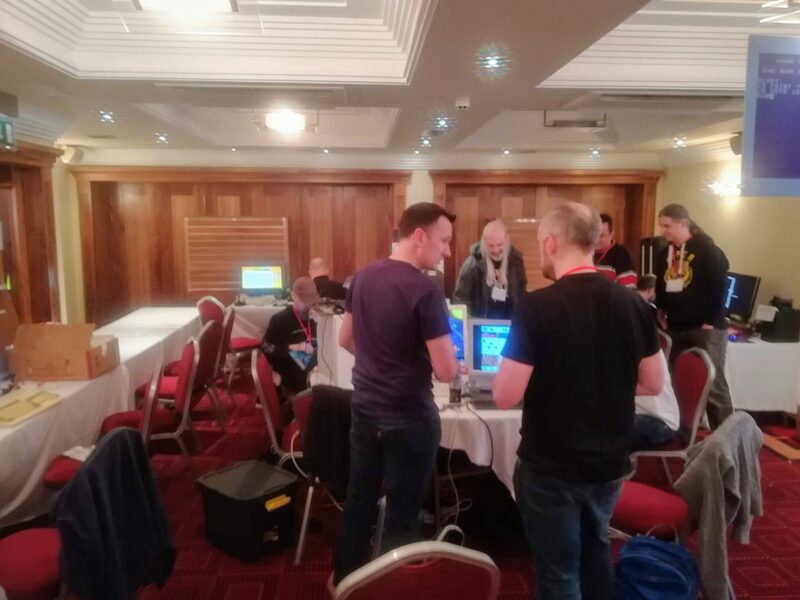 At 5 pm Iarla and Rob from the Amiga Ireland podcast officially opened proceedings by recording a short podcast session live, along with Sensible Soccer tourney organizer Kenny in place of regular co-host Luke. Boat then hosted a quiz in which, amongst others, yours truly got thoroughly beaten by Pixel Vixen of the eponymous Youtube channel. 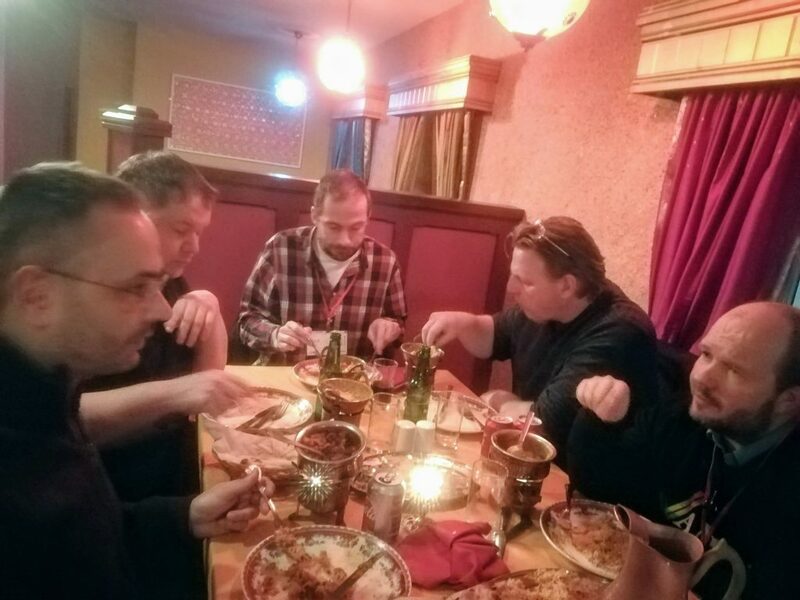 After briefly pausing for beers and curries at a nearby indian restaurant, proceedings continued well into the night. There was a music module compo, as well as tournaments in Sensible Soccer, Skidmarks, Stunt Car Racer, Speedball 2 and the infamous C64 game Paper Plane. As the one-day ticket holders arrived on Saturday, the place filled up to capacity. 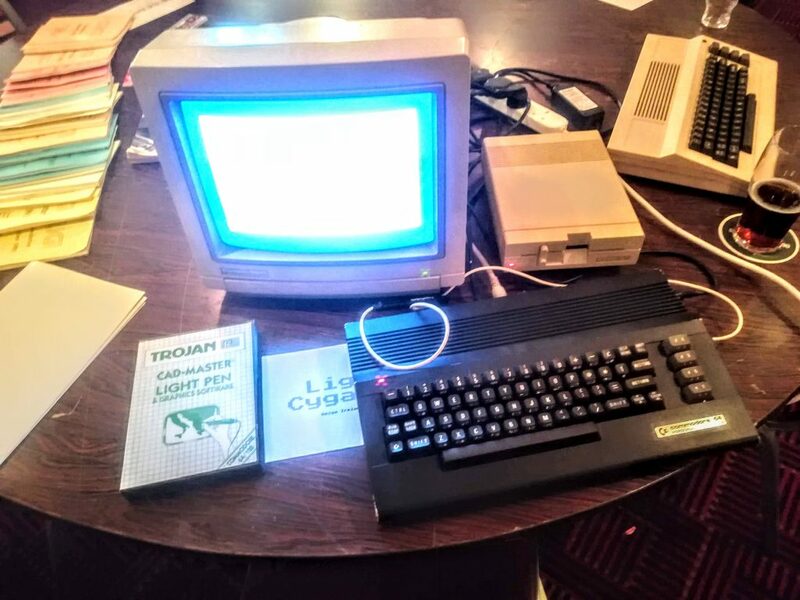 Apart from gaming tournament finals, the day’s highlights were talks by a number of the movers, shakers and celebrities of the Amiga community. 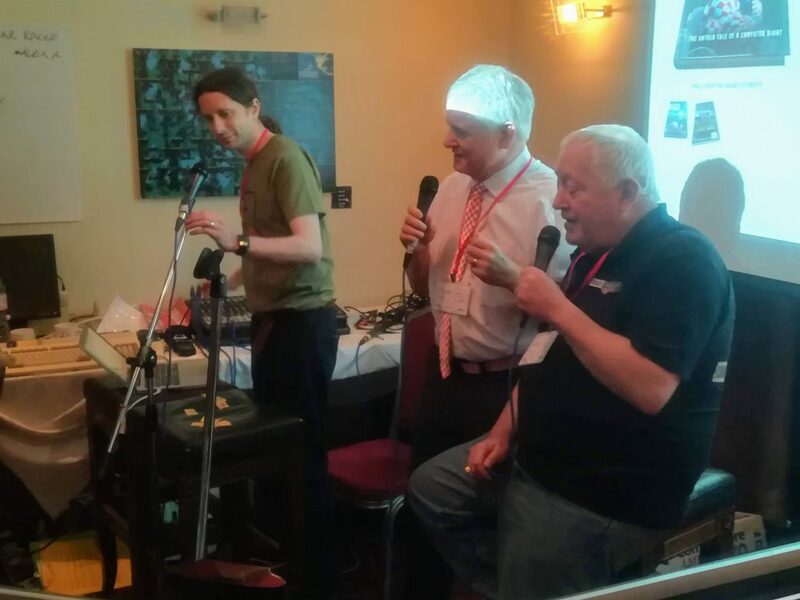 AROS developer Neil Cafferkey, Amiberry developer Dimitris «MiDWaN» Panokostas and Amiga Future Blitz Basic tutorial writer and Amiga Ireland podcast co-host Rob Cranley were some of the people who held presentations or workshops. 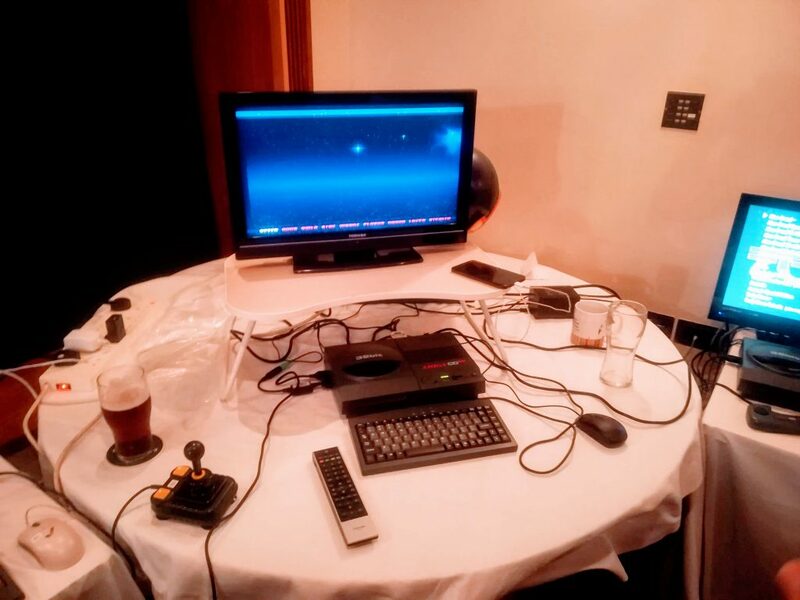 Former Commodore UK co-CEO David Pleasance was interviewed by Trevor Dickinson of A-Eon / AmigaOne fame. The Settlers developer Volker Wertich was interviewed over phone and video stream by event organizer and Amiga Ireland podcast co-host Iarla O’Reida. The latter was a huge treat for yours truly, as I may have sunk more hours into The Settlers than any other game – Civilization and Skyrim included. 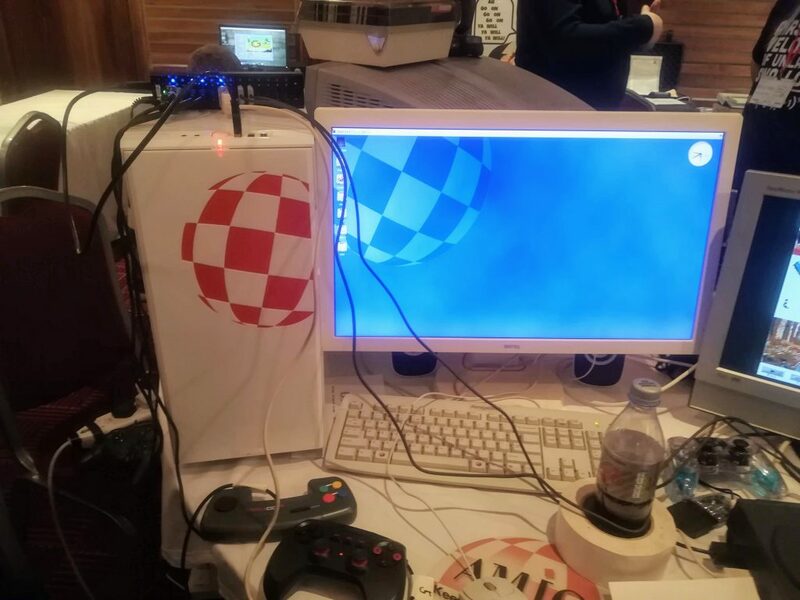 Original Amiga development team member and Workbench interface developer RJ Mical was also scheduled to talk, but unfortunately couldn’t make it due an important health-related appointment («having his intuition.library fixed»). 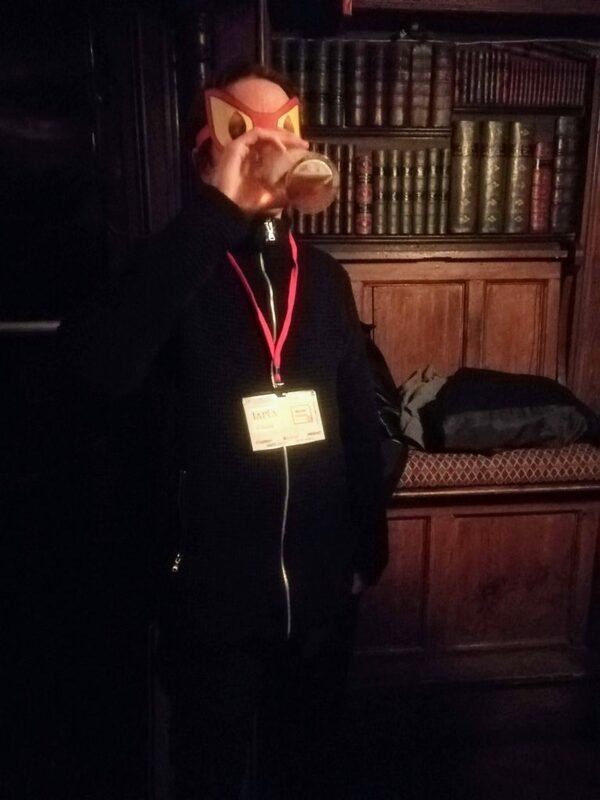 The general atmosphere of the event was extremely friendly and relaxed. The event in general was very well organized and the various events interesting, although some of the workshops might have benefited from being more hands-on, and moved from the main stage to a separate room. Many attendants had various pieces of hardware on display, all ready to answer questions and let you try their stuff. 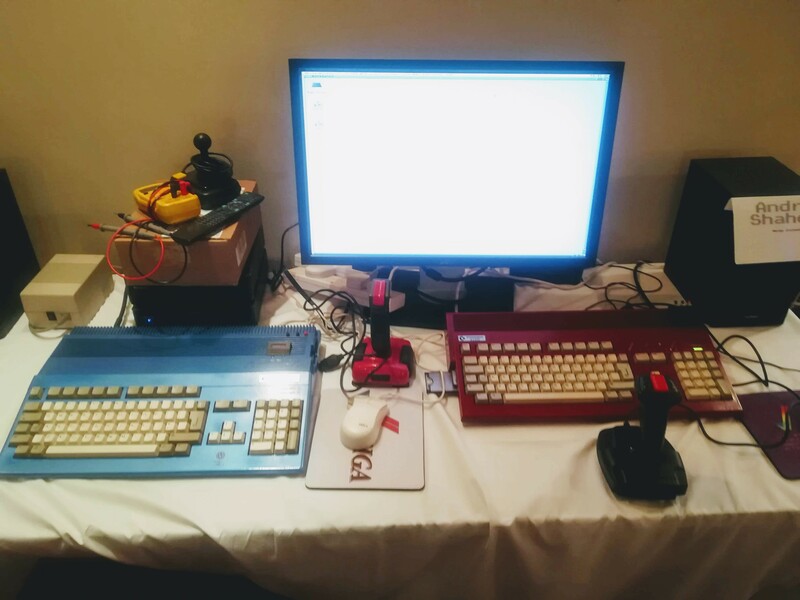 Apart from the now ubiquitous vampirized A500s and A600s, there were several CD32s, A1200s, a couple of AmigaOne X1000s, an A4000, and few C64s. There was one particular piece of hardware on display that had me running off to get some coffee in order to sober up before double checking that my eyes weren’t deceiving me (i was well into my fourth pint of Smithwicks at the time): A fully working A570 CD-ROM drive – a very rare piece of kit that for all intents and purposes turns your A500 into a CDTV. and all too soon it was time to say our farewells to all our new friends, in order to hit the sack for a few, short hours before our early flight back on sunday. 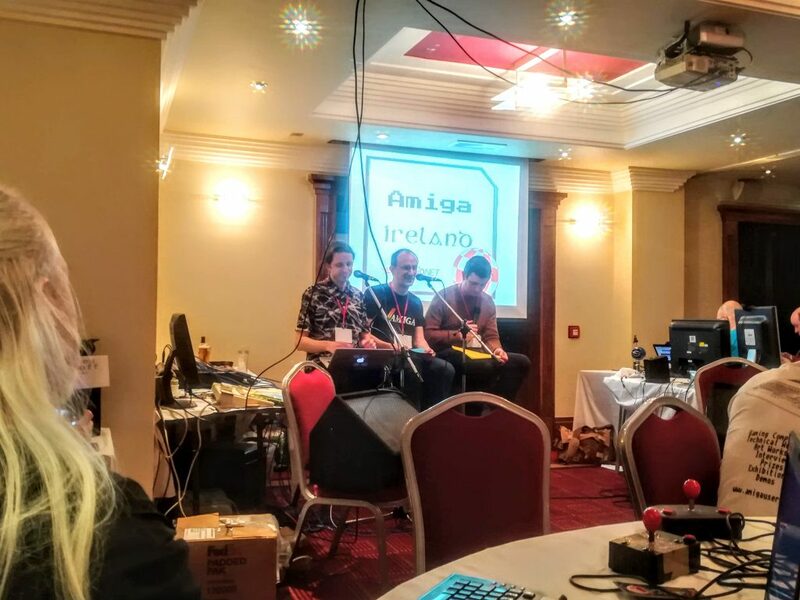 The dates for Amiga Ireland 2019 have already been announced (although the amigausers.ie web site has not been updated yet). 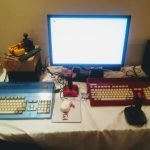 So if you have an interest in Amiga and the Amiga community (and let’s be honest, you wouldn’t be reading this if you didn’t) – and you can make it, there really is very little reason not to! ← I AM back …in a re-run. The Running Man remastered. Great stuff! Damn it looks like a helluva event…booze, food, and old school Amiga…my kind of show!